Nik started playing footy at Under 10’s with Aberfeldie in the Essendon District Football League in Melbourne (EDFL). He played most of his junior footy there, apart from two seasons at Doutta Stars in the same league. At the same time he was playing footy at Penleigh & Essendon Grammar (PEGS) School. It was here that he met his teacher, Michael Gallus (Footys4all and CrossCoders coach) who was one of the people who got in Nik’s ear about NFL punting. The next step in the journey for Nik is to head to the USA in July. 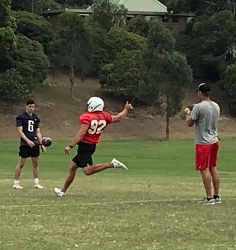 He must train every day and keep his university grades up to a high standard – a requirement and expectation of college teams – and from there go through the more formal try-out processes. It will be hard work, but the rewards could be enormous. Nik admits that floating around somewhere in the back of his mind is the thought of playing American Football in front of crowds regularly in excess of 100 000 people. Buried further in his psyche is the thought of the Super Bowl. 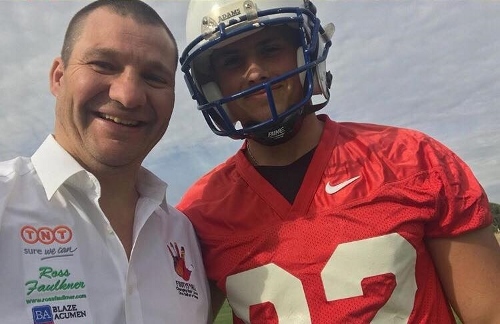 Former VFL players like “Diamond” Jim Tilbrook, Saverio Rocca, Ben Graham and more recently Ben Lennon and Ben Griffiths have turned from the AFL to the NFL and enjoyed careers of varying degrees of success. 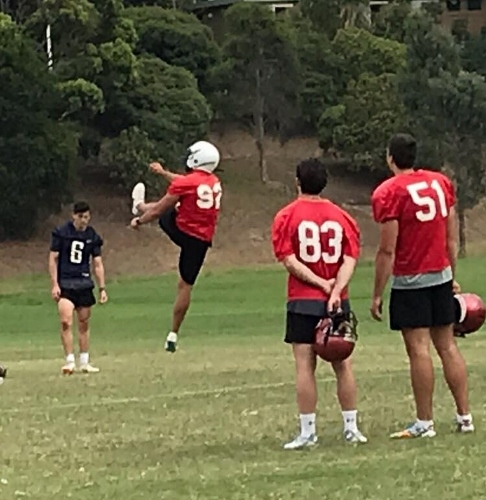 However, it is interesting to see that younger players who haven’t yet reached AFL level are considering their options to switch from Aussie Rules to American Football. Nik has an enormous journey ahead, but he has the talent and the drive to blaze a train that others can follow, no matter where they are on their own Aussie Rules journey. It will be interesting to hear how he goes from here in his quest to cross codes and pursue a future far removed from his childhood days of supporting Hawthorn.